Hospital, School, Commercial and office Indoor Air Quality applications vary. From Hospital Acquired Infection (HAls), Sick Building Syndrome, absenteeism and work place productivity, Indoor Air Quality influences these facilities in many differents ways. OBJECTIVE: Eliminate up to 99.9999% of airborne bio-contaminants including viruses and bacteria that circulate through the ventilation system without increasing the pressure drop resulting from high efficiency filtration. 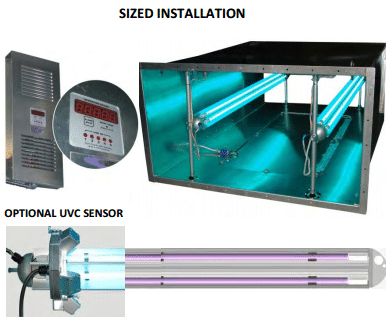 EQUIPMENT: UV Bio-Wall UVC systems installed in the ventilation duct parallel to the airflow, allowing sufficient contact time that is required for airborne sterilization. The UVC intensity of each lamp can be measured in “realtime” with an optional UVC sensor, ensuring the required inactivation intensity will be delivered to the contaminant. OPERATION: To create the sterilization chamber in the existing duct (up to 5 feet deep per unit), the walls are covered with an aluminum reflective material. The proprietary sterilization sizing calculations take into account: air velocity, dimensions of the duct, the UV lethal dose needed to sterilize the microorganism for the desired inactivation rate. The sizing calculations will determine the number and length of UV Bio-Wall(s) required. The optional UVC sensor will guarantee that the UVC emitted from the lamp will exceed the amount of UVC that is required at all times. UVC GERMICIDAL PRINCIPLE:The 254nm UVC germicidal wavelength has been used for decades for sterilization and its effect on microorganisms is well documented. UVGI inactivates microorganisms by damaging the DNA structure of the microorganism, making it incapable of reproducing. The germicidal efficiency can deliver virtually a 100% disinfection rate. The system can achieve exceptionally high disinfection rates as a result of the UV Bio-Wall being mounted parallel to the airflow and the desired intensity is sized for each particular application.